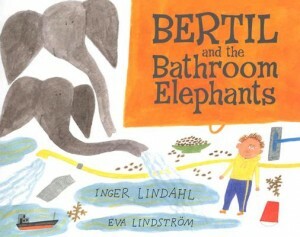 It seems clear that the elephants are all in his imagination, but what’s with the bathroom sneak attacks? Is this a story about the trials and fears of potty-training? Did the elephants really exist, or did Bertil psyche himself out and imagine the attacks as well? Was it just a strange noise? What makes a bathroom elephant turn bad? Perhaps something was lost in the translation, but this is one odd book. Preschoolers, however, will love it.